The future Emperor Paul I was born in the Summer Palace of Elisabeth Petrovna in 1754. That palace made of wood was erected in 1741-1744 by the architect Bartolomeo Rastrelli. There was a large garden near the palace. The Summer Garden was situated in front of it. Empress Elisabeth Petrovna liked to live there. Paul I spent his childhood here. In 1797 Paul I ordered to pull down the palace and to build a castle in its place. The Mikhaylovsky Castle was erected by the architect Vasily Bashenov with the assistance of Vincenzo Brenna in 1797-1800. There was a legend according to which a shining youth ap­peared to a guard standing at this point near the Sum­mer Palace of Elisabeth Petrovna, and said that he was Archangel Michael and ordered him to go to the Emperor Paul I and tell him to construct a temple in his honour in this place. The work of the erection of a castle and a church continued day and night. The castle was sanctified on the 8th of November in 1800. The castle was surrounded with trenches with drawbridges, twenty canals were ready to fire. Paul I believed that secret passages inside the castle, the earth­en ramparts and moats surrounding it and the draw­bridges would be reliable protection against the con­spiracies budding at court. But the emperor resided only some forty days in his new castle. He was mur­dered in his castle by his close associates at night on the 12th of March in 1801. After the murder the Mikhaylovsky Castle was giv­en to the Commissariat Department. A few years later the Central Engineering College was housed in the cas­tle. The future writer Fyodor Dostoyevsky was one of its graduates. 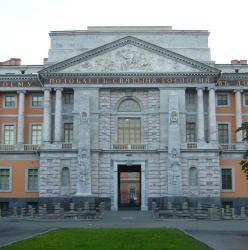 Today the Department of the Russian Museum is housed in the Mikhaylovsky Castle.